October is Women’s History Month. This year’s theme is #MakeAnImpact. Every Wednesday we will be featuring a woman who made an impact on Dartmouth or Nova Scotia’s history. All the posts will be gathered here for you to read en masse. Margaret Floyer was born in Louth, England around 1755. Margaret made an impact on Dartmouth’s history as the mysterious and intriguing resident of Brookhouse. Margaret was born to Captain William Floyer and Frances Ayscoghe. Her family was a well-known, prominent family in England. Sometime in the 1780s, Margaret left England with her brother, Lieutenant William Floyer, and arrived in Dartmouth. They built a house near Old Preston Road, now the community of Woodlawn, where they resided together. 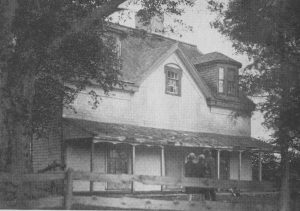 The Floyer’s did have servants coming in and out of the house, but aside from staff, with very little interaction with the community. It is described by historians as an exile. Nothing is really known about why Margaret Floyer came to Dartmouth or why she lived such a solitary life. Most of the information available about Miss Floyer comes one of our previously featured #WomensHistoryWednesday woman, Mary Lawson. In Lawson’s book, History of the Townships of Dartmouth, Preston and Lawrencetown, Margaret Floyer is described as “a refined, intellectual woman, with a sweet sad face, gentle and winning address, very reticent and quiet, but exceedingly courteous to all who knew her.” Lieutenant William Floyer left Dartmouth sometime after 1795 to join his regiment in Jamaica. It was a surprise to the community that Miss Floyer did not join him. Nobody was sure why not. No reason was given when asked, which seems to be pretty common when it comes to Miss Floyer. The marital status of Margaret Floyer is also a bit of a mystery, despite always being referred to as Miss Floyer. On a land deed from August 1786, she is described as a ‘widow’. On another deed from January 2, 1789, the whole land was mortgaged to Lieutenant Floyer and Margaret Floyer, a ‘single woman’. However, after that she is again listed as a ‘widow’ on mortgage documents. Community members at the time suspected William was her lover and not her brother, but historical records seem to support him being her brother. Another interesting aspect of her story is the male lodger she had residing with her from 1793 to 1814 After St. Pierre was taken by the British, Monsieur Danseville, the governor of was transported to Halifax and after coming across her cottage, he asked to reside with her. Soon after he built a larger house on her property since he did not know how long it would be before he could return to France. It was known as the Governor’s House or Brookhouse. They resided together until 1814 when Monsieur Danseville returned to France. Margaret Floyer died on December 8, 1815 and is buried in Woodlawn Cemetery.